If you have encountered numerous third-party ads and pop-ups within your web browser, it is a strong indication that Shop Time is active on your operating system. Even though Shop Time is advertised as an excellent tool, which should help you save time and money while shopping online, you must known that Shop Time, in fact, is just one more adware application. The research has discovered that Shop Time is yet another adware protram that is developed by the notorious SuperWeb LLC group, which recently has launched a variety of intrusive adware programs. 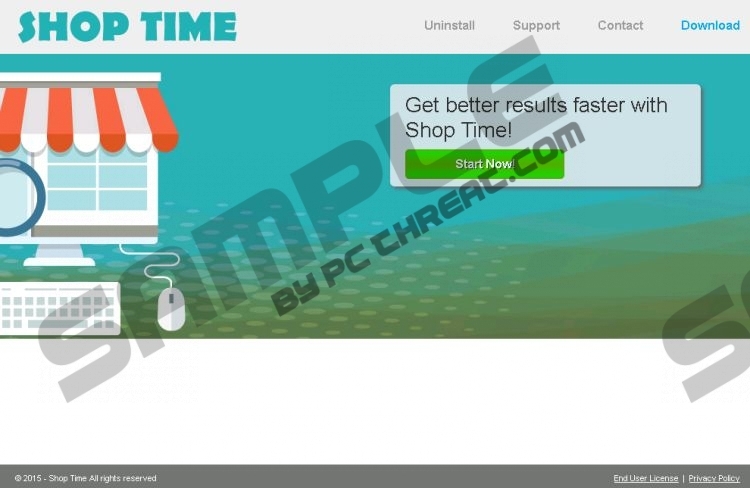 Just like the majority of other programs developed by this group, Shop Time must be removed from your PC as soon as it is detected on your PC. If, unfortunately, your PC is already infected with Shop Time your browser will be flooded with various unwanted ads and pop-ups every time you browse the web. The ads and pop-ups will be presented to you at random times whether you like it or not and you will be made to fight through them each time you surf the web. To restore the standard functionality of your web browser, you will need to remove Shop Time thoroughly from your PC once and for all. It has been discovered that Shop Time will also start gathering information about your browsing habits once it gains access to your PC. Your geographical location, favorite websites, time spent on them, and similar information will be gather by Shop Time. Once this info is gathered, it will be used to create customized ads according to your browsing habits. We advise you not to click on any ads even though they might seem tempting because during the research we have discovered that some ads provided by this adware cold be implemented with redirect links. So by clicking on anything that Shop Time provides you with, you risk of getting your PC exposed to potentially malicious web content. You could land on fake online shops or website promoting malware. Both instances are extremely dangerous and should be enough to convince you that the removal of Shop Time is a must. Follow the removal guide that we provide below carefully, and you should not encounter any major problems. Once you have executed the manual removal, make sure to conduct an in-depth analysis of your PC for potential leftover traces of Shop Time. It has been noticed that in some cases even a few leftover files or registry entries could be used by other Internet-based infection as a backdoor into your PC. Select Shop Time and click the Uninstall button. Right-click Shop Time and select Uninstall. Quick & tested solution for Shop Time removal.